The thyroid gland is made up of two lobes joined by the isthmus and normally weighs approximately 30 grams. Embryologically, the gland develops from the endoderm at the floor of the pharynx and descends along the thyroglossal duct to the base of the anterior neck. The thyroglossal duct may fail to obliterate completely giving rise to thyroglossal duct cysts and may give rise to a small remnant known as the pyramidal lobe. In addition, ectopic thyroid tissue is commonly found along the thyroglossal duct path. There are normally four parathyroid glands, two superior glands located at the middle of the posterior border of the thyroid, and two inferior glands at the inferior border of the thyroid gland. However, there is some variability in the number and position of the parathyroid glands, especially the position of the inferior glands due to their embryologic origin. The normal parathyroid gland is too small to be seen on most imaging modalities including ultrasound. There are six cervical lymph node compartments of the anterior neck, labelled I to VI, including the retromanubrial compartment (also known as compartment VII) which is an extension of the central compartment (VI). 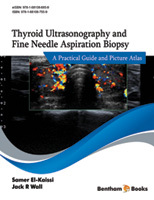 The use of lymph node compartments during the ultrasound examination is essential for accurate localisation of cervical nodes in future ultrasound studies, to perform cervical node biopsies and for surgical excision of suspicious nodes.